Michigan State Youth Soccer Association is a non-profit sports association with dozens of corporate sponsors and hundreds of members. The organization also publishes Michigan Soccer Magazine, the premier soccer, direct mail magazine in Michigan. 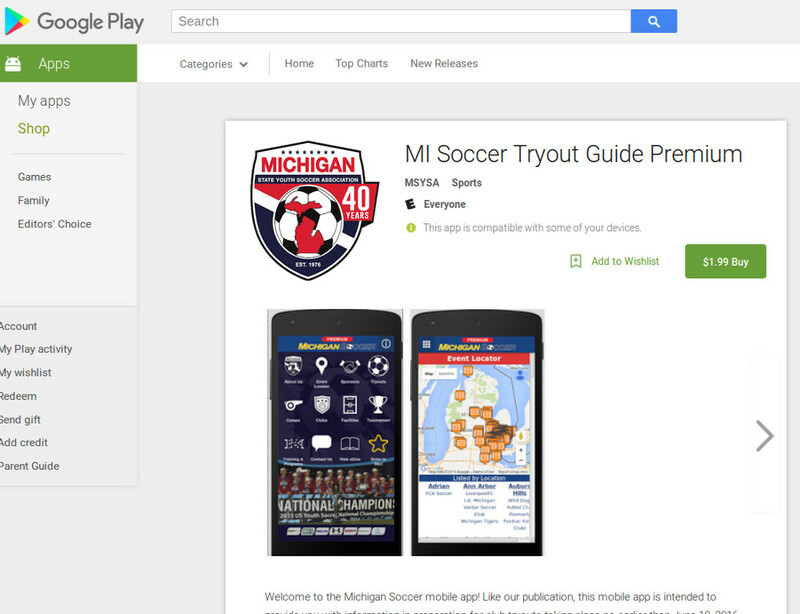 Seeking to better serve their members, the MSYSA decided to go mobile in 2015, with free and premium versions of their Michigan Soccer Tryout Guide offered for both the iPhone and Android. Michigan Soccer really wanted to up their game and better to their sponsors and member organizations alike. Moreover, with tens of thousands of parents depending upon them for informational needs during state and regionally hosted youth soccer events, a set of free and premium mobile apps made sense as an informational delivery platform during the events themselves. We were tasked with developing a set of mobile apps which leveraged content from their Michigan Soccer Magazine Tryout Guide, as well as to enhance functionality with a Google Maps integrated Event Finder allowing parents and players to find tryouts, tournaments, and facilities. Moreover, all of this needed to be done quickly in order for the apps to be ready by a major mid-May event. From content receipt to availability on iTunes and Google’s Play Store needed to be under three weeks. Our mobile development team was ready to go upon receipt of the Michigan Soccer Magazine Tryout Guide content. Moreover, we were able to deliver the mobile app early, as both sets of mobile apps were available on iTunes and Google Play Store by the last week of April. On each platform, two versions of the mobile apps were developed: a free version, available to everyone and populated with content from advertisers and sponsors who paid for inclusion in the free mobile apps in addition to Michigan Soccer Magazine; a premium version which included all advertiser and sponsor content, including tryouts, tournament info, and facility info, all findable in an in-app event finder powered by Google Maps. The mobile apps needed to be available on iTunes as well as Android, and support all major iPhones, Android smart phones, the iPad, and Android tablets. On both platforms, there needed to be both free versions and premium (paid) versions of the mobile apps. Advertisers and sponsors who wished to pay for publication of their events and facilities in the free version leveraged an advertising intake portal we developed to manage the complexity of handling hundreds of advertisers, their graphic designers, and accounting specialists. Very impressive responses from our customers and prompt support when needed at all hours!…[Choosing a vendor] wasn’t an easy decision by any stretch due to the magnitude of the project. But, we know we made the right decision.